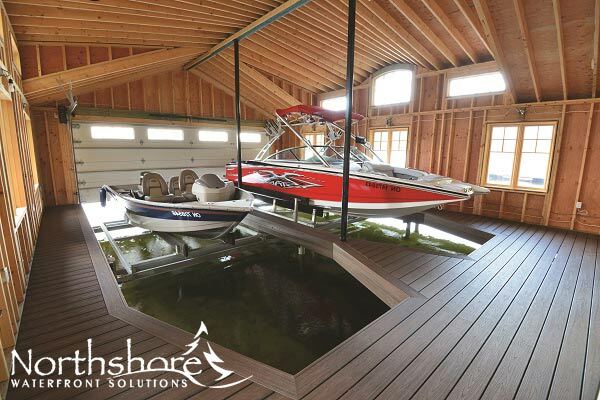 The Hydraulic Undermount Boat Lift maintains a clean, cable-free look in your boathouse or on your dock with an open water slip beneath your boat. 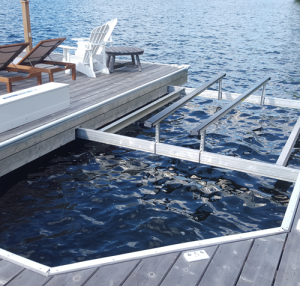 All mechanical components are underneath the decking in the structure of the dock system and above the water, no components are in the water. An aluminum deck box keeps the batteries and other components neatly contained. The lift is simple to operate with a wireless key fob and is hard-wired to a lockable box with a manual switch. The lift is attached to the dock structure above the water leaving ALL components of the lift free and clear from the water. 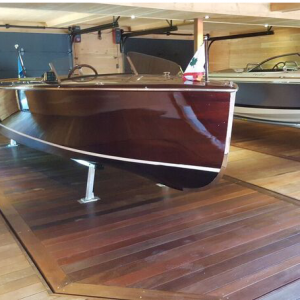 No overhead steel is required giving you a clean uncluttered boathouse free of cables hanging from the ceiling. 24V operation, complete with charger that plugs into a standard outlet or a solar panel. Hydraulic cylinder completely retracted when the lift is up in the storage position. 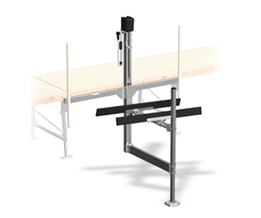 Lift locking device for longer periods of storage. Cables under constant tension, never wound resulting in consistent lift placement every time. Leave your boat on the lift year round. Why our Hydraulic Undermount Lift? Vertical Lift is best! 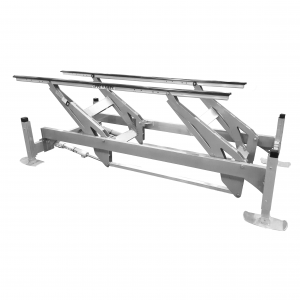 You don’t have to worry about damaging your boathouse door when lowering your boat. Fast! Lift travels at 8 ft per minute. Stability! 4 to 6 points of contact are made along the perimeter of the cradle thereby giving you the best in stability.